This morning my parents texted me to ask what our Easter plans were and my first and only thought was Easter? That’s next month. I have no idea. And then I realized that no, Easter is not next month. It is next week. And I had a panic attack. Where has the spring gone? Where have I been? What am I doing? It was an existential crisis type morning. I’ve been on the road, constantly, every weekend, bouncing from town to town and event to event. All for the best and all for people I love, but never the less I am road weary. And with no signs of stopping. This weekend we’re headed to San Francisco for a week, and then it will be May, a month full of weddings and trips and, before we know it, June. And Easter will come and go and since we’re taking a red eye home from California on Easter Eve I’ll probably sleep through most of it and I definitely won’t be eating ham or deviled eggs (I have a strong suspicion that this will be a takeout Indian type of Easter). But YOU will be home and YOU will be well rested and ready to celebrate, so therefore YOU should make a ham. This ham. Smoke it. It’ll be like no ham you’ve ever tasted, I promise. And I’ll just lay in bed and snuggle my dogs and pretend I’m at your house for Easter dinner. Unless, of course, you’re delivering. ed note: This recipe calls for a fresh, uncured ham. 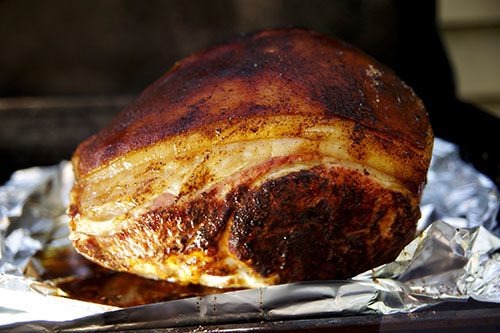 Adding wood chips to the grill gives the pork a smokey flavor, but because it is uncured the flavor is more in the style of a pork chop than traditional honey baked ham. The day before you’d like to cook and serve your ham, prepare your brine by combining all the ingredients in a large pot of water and submerging the ham completely. Cover and let sit, in a cool place, for 24 (or up to 48) hours. The next day pat your ham down and place on a lined baking sheet. Mix together seasonings and rub evenly over ham. Cube butter and lay across ham. 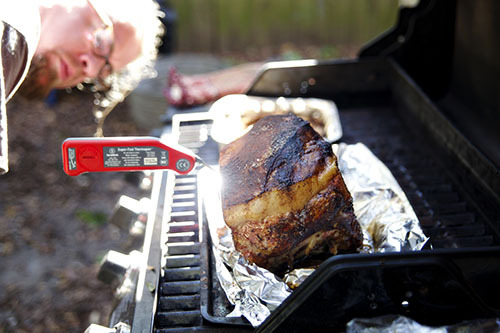 Heat your grill and place the ham over indirect, medium-low heat. Soak hickory chips in water and wrap in tin foil. Place on the grill next to ham. Cover and let cook, checking to baste occasionally. Cook for 15-20 minutes per pound, or until the internal temperature meets 150F. 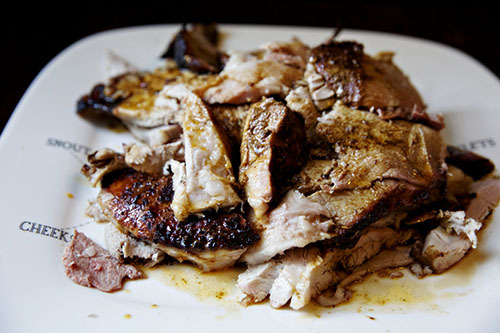 Once finished remove from heat and let rest 45-60 minutes before slicing and serving.